States across the country are witnessing a surge in distributed electricity generation. DG has the potential to provide significant economic and reliability benefits. DG powered by zero- or low-emissions resources may also confer significant environmental benefits. But not all DG comes from these relatively clean sources. Increased reliance on “dirty DG,” especially DG that runs on diesel fuel, has the potential to create various environmental and human health problems. 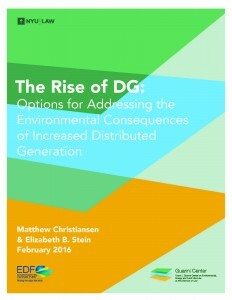 In this policy brief, Christiansen and Stein address the potential consequences of increased reliance on DG and present options for controlling emissions from dirty DG.